The financing method you use to go solar on your home is an important decision and worth substantial consideration. Which solar financing option is right for you is directly tied to your financial goals, both in the short and long term. The three main home solar financing options are an outright Solar System Purchase, Solar Leasing and Power Purchase Agreements. This article focuses on purchasing a solar energy system whether you use your own cash or secure a home solar loan. Financial Benefits of Home Solar Power In general, an outright purchase of a home roof top solar energy system is meant for people interested in realizing the maximum financial benefits of home solar power. When you own your own solar power system you keep 100% of the financial benefits directly in your own pocket. Cost of Owning a Home Solar System The average cost of a home photovoltaic solar system is around $15,000 to $25,000 with an average pay back period of 6 to 11 years. 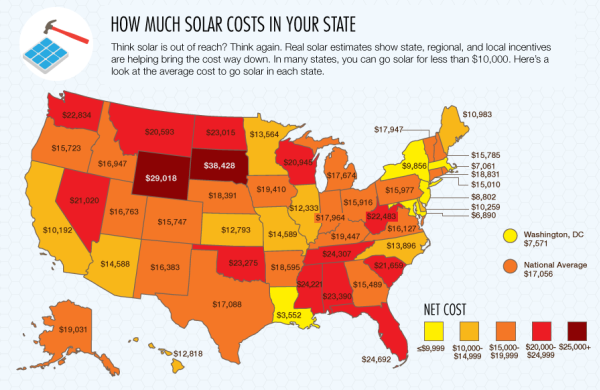 The net cost and payback can be greatly reduced depending on the area you live in and are influenced by local solar policies and incentives. Rebates and Incentives – The cost of your system can be reduced by as much as 50% depending on the area you live in. A solar consultant and installation expert in your area will help you file all the necessary paperwork to reduce the initial cost of your home solar system. Free Electricity – You own your system and all the energy it creates. Your roof-top solar system changes the suns energy into electricity and is wired directly into your home. The energy from the sun is 100% free and works for you during all daylight hours. Net-Metering – Net metering allows for you to sell the excess electricity your home energy system creates back to your local utility company. As energy costs continually rise so does the amount the energy company must pay you. It is possible in some areas to actually produce more energy than you use and you might even get a check from the utility company. Net metering rules vary from region to region, consult a solar expert in your area to see if you qualify for net metering. Home buyers consistently have been willing to pay more for a property with PV across a variety of states, housing and PV markets, and home types. Average market premiums across the full sample of homes analyzed here are about $4/W or $15,000 for an average-sized 3.6-kW PV system. If your system costs you $15,000 and increases property value by $15,000 that’s a wash! This is an overview of some of the advantages of an outright purchase of a photovoltaic home solar system. A prepaid Solar Lease or PPA will also yield approximately the same savings and advantages. Contact a specially trained solar consultant to see if an outright purchase meets your financial goals.